Our comprehensive introduction to cosmetic (dermal) fillers. In this page you will find everything you need to know about cosmetic fillers, from one of the top Dr's in the country! If you have further questions, or would like to set up a free one-on-one consultation, please call us at 303.469.0064 or send us an email. We have put together a comprehensive “buyers guide” with more information you should know before getting dermal fillers, a full “aftercare instructions” guide, and a multitude of instructional demo videos so you can get the most out of your cosmetic fillers! In short, fillers help to diminish facial lines, restore volume, and add fullness to the face. As we age, we all lose volume in our faces (lips, cheeks, under eyes) as there is generally a loss in subcutaneous fat. As there is less fat, our muscles work closer to the skin, creating deeper smile lines and crows feet. There are other factors that contribute to deeper lines and loss of volume, including sun exposure, lifestyle, and genetics. Cosmetic fillers can literally fill in the areas of volume loss, giving us the appearance of a more youthful face, at a fraction of the cost (and downtime) of “traditional” surgical facelifts. Wrinkle fillers can also be used as “volumizers” – plumping and lifting trouble areas like cheeks, jawlines, chins, and temples, or filling in thin lips – or to help fill in acne scars. Treatments are usually quick and easy. For the most natural looking results, you want to work with someone who has experience, as well as artistic eye for detail. Ideally, the use of dermal fillers help you look like a younger, natural, refreshed version of yourself. In our Broomfield, Colorado office, Dr. Janowski prefers a variety dermal fillers. Each offer slightly different results, and can be used in different areas. He will recommend what will work best for your concerns in your one-on-one consultation. Dermal fillers have many benefits, not the least of which is their flexibility. They can be used on almost any area of the face to improve your appearance or restore your youthful look. When I evaluate someone for fillers, I separate their face into thirds: The middle third, and outer two-thirds. Why? Most people are focused on the middle third of their face, and for good reason. This is mainly what they see when they look in the mirror. The areas between the brows, under the eyes, and around the mouth garner the most attention. These areas are important, and should be corrected. Dermal fillers can be used to give a nonsurgical brow lift. Part of the reason why brows and eyelids sag is due to a loss of volume in the eye area. Restoring volume can turn back the clock, and may give even better results than surgery. Usually injected under the eyebrow Restalyne Lyft is an excellent choices for the because they can add enough structure to lift the brow. Another common area where volume is lost is the region under the eyes. This can lead to a hollow that is shaded, giving the appearance that the skin under your eyes has become discolored, the so-called bags under the eyes. This is also described as a tear trough deformity because the curved line that runs from the inner corner of your eye looks like it’s designed to catch and guide tears. Using a very soft product like Restalyne Silk can add volume without puffiness to this delicate area. Lifting the midface often creates the most dramatic and beautiful changes to the overall face shape. As we age, the proportions of our face change. We go from have a diamond-shaped face, with defined cheeks, to having a drooping face – more like a square – often with heavier jowls and hollow cheeks. If you have always wanted higher or more prominent cheekbones, we can achieve that appearance using fillers designed to give good tissue support like Radiesse, Restalyne Lift, or our favorite filler, Sculptra. If you are developing hollows in your cheeks due to excessive weight loss or aging, the same structural fillers can be used to restore volume to give your face a healthy, youthful appearance. If you’ve never had luscious lips or if your lips have thinned with age, dermal fillers can be used for lip augmentation. Fuller lips are both more attractive and more youthful in appearance. Although smiling is in itself good, some of the effects it leads to may not be. Common smile lines around the mouth include the nasolablial folds, which curve from the corners of the nose around the mouth and downward. They may be called “marionette lines” if they extend all the way down. Dermal fillers can also be used for chin augmentation if you have a receding chin, want to create a cleft chin, or want to otherwise change the appearance of your chin. Most of the time people see us at different angles, rarely straight ahead. It is actually the lateral two thirds of the face that require more rejuvenation efforts, particularly if one is thin, active or athletic. This is where the majority of our youthful volume is lost. Sunken temples, sharp cheek bones and hollows under the cheek are tell-tale signs of age-related volume loss. Look at a picture of a young model (or a picture of your younger self). They are full with soft contours around the sides of the face, with minimal shadowing. Jawlines are straight with no jowling. Jowls form as a result of loss of cheek volume. So when we volumize these areas, often the jawline will straighten out again. When you come in for your complimentary, complete and educational consultation with Dr. Janowski, he will help you select the filler options that best meet your goals, needs and budget. He works with 10 different types of fillers regularly – each with their own specific and best uses. While we always defer to his best judgment in selecting fillers, we thought we would share information on each type of filler and it’s best uses. Fillers can be separated into 2 different categories: Hyaluronic Acid Wrinkle Fillers (shorter term) and synthetic collagen stimulating fillers (long term). These are typically the most popular and well-known type of wrinkle fillers. Each type works in a slightly different way with varying results. Hyaluronic acid is a naturally occurring substance in the body and breaks down over time. How fast the filler breaks down depends on your own body chemistry – and so the figures provided are just estimates. We often find that our more athletic and/or sun loving patients “burn” through fillers more rapidly. These can be used anywhere in the face and lips – but each has it’s own best use. Some are thicker and others are softer – affecting where they should be placed. If you use a filler that is too soft in an area that needs more structure – the filler can “get lost”. 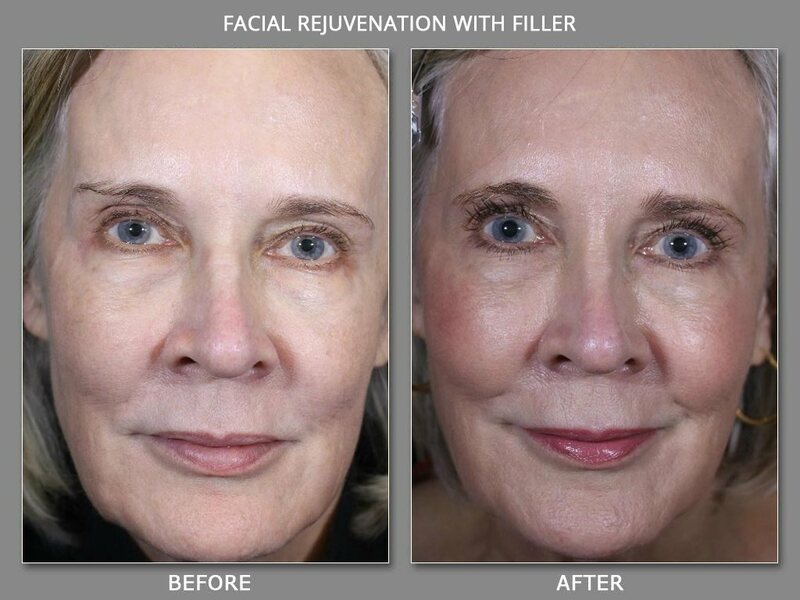 If you use filler that is too firm in an area that calls for a softer filler – your results can look unnatural or stiff. Also, the softer the filler, the more superficially (or closer to the surface) it can be injected -which is good for shallow areas – like under the eyes or in the lips. This is why it’s important to see a Dr. with extensive experience when deciding on filler treatment. *Radiesse is an a category of it’s own. It is a shorter-term filler, but is not made of hyaluronic acid. Radiesse is made of Calcium Hydroxylapatite (a substance that occurs naturally in human bones and teeth). It breaks down over time – usually after 1 year. It’s a firmer filler and is good for people needing to add structure to aging faces – especially in the mid-face area. We also find it to be a great filler for me – who sometimes need a more structural filler because of their thicker skin. Long-term collagen stimulating fillers actually stimulate your own collagen to grow in as the filler. This takes some time, but the results are very long-lasting – from 2-5 years in the areas treated. While your face will continue to age, and you will need annual touch-ups, once you’ve completed a Sculptra or Bellafill treatment series – the results will have long-term staying power. These fillers can be used anywhere in the face EXCEPT the lips. Because of their longevity, they can offer patients a great value. The easiest way to think about this is our face changes from a triangle, to more of a square as we age (and, eventually, to an upside-down triangle). This is because the middle third of our face is the most volumized when we are young, and with time, this area “deflates”. At the same time skin becomes loose and jowls form in the lower third of the face. We need to reverse this by adding volume back into the middle third, thus “pulling up” the lower third. The lifting quality of fillers is one of the most important. Lines and wrinkles form for several reasons: our skin thins out with age due to less collagen and elastin; we lose volume underneath the skin; our skin is damaged by sunlight, smoking, and other factors. We used to think of fillers as products that simply go after these lines and fill them back up. That can be done, but we do not want to miss the forest for the trees. Volume correction is how we achieve a more youthful result, not filling in lines. Even lines around the mouth require volume support in addition to the typical “filling in” of smokers lines, etc. Older thinking was simply to correct an “area” such as cheeks, mouth lines, etc. Newer thinking is to provide full facial correction and have it last for many years. Collagen-stimulating fillers such as Sculptra and Bellafill can achieve this. We want to look at not only each area of volume loss, but how it relates to the areas around it. For example, to fill cheeks but ignore the temples above and the jawline below is to provide an incomplete treatment, one which changes the normal proportions of the face. It is not wrong to do this, but does not yield the best possible result. With the above-mentioned collagen stimulators like Sculptra and Restylane, we now can provide results that last 5 years or more. This completely changes how we think about these products, and how we perceive their value. Whereas traditional fillers will last typically a year, disappear, and then require full treatment again, collagen-stimulators are placed in a series of treatments, get better over the ensuing 6-12 months, then require only minor touch-ups over the next 3-5 years. Thus the cost-curve is reversed: Sculptra and Bellafill get cheaper with time, where traditional fillers get more expensive. Who is a Good Candidate for Fillers? While 90% of patient have bruising and swelling, it is always a possibility. We recommend that you do not have filler injections immediately before a big event, but rather give yourself two weeks beforehand to ensure you have the best results. Bruising is much less likely with the advanced injection techniques using microcannulas that Dr. Janowksi uses. Any bruising and swelling will fade naturally within a few days to a week. Using Restylane to achieve fuller, younger looking lips is one of the most requested procedures in our office. The overwhelming majority of patients love the natural results. However, we have all seen the horror stories of overfilled lips. Unfortunately, this over-filled look is often the result of inexperienced injector. Achieving natural looking lips requires skill. The over-filled “duck” look comes from over-injecting the top lip without a balancing lower lip injection. Dr. Janowski recommends never inject only the top lip, but rather balancing both lips for the best results. Again, a modest additional of volume to the mid-face looks great on most people. Having fuller cheeks is a short-cut to looking younger. Dr. Janowski always recommends starting conservatively, and adding more filler, if needed. Fillers, if done properly, always look natural and not overdone. Ideally, friends and family will think you look younger, but can’t quite put their finger on why. Dr. Janowski does a full consultation with every patient, and will be able to work with you to make a customized anti-aging plan based on your goals, concerns and budget. We generally say that one syringe is good for one area of the face, but that depends on your age, skin condition and goals. Of the three fillers Dr. Janowski use, most last about one year. However, how long each lasts depends on your particular body chemistry, as well as what area you have had treated. Lips are in constant motion, so the product wears off more quickly, and lip injections generally last 6-12 months. Most people choose to have a touch up done within a year of the original treatment, and results are best with continued use, so be sure to schedule your next appointment as the results are beginning to fade. Dermal fillers are injected into the skin (dermis) and provide volume where volume has decreased. The results can be seen immediately. The treatment takes about 20-30 minutes and the result is immediate. When treating wrinkles, pain relief is usually not needed but can be easily achieved with topical anesthetic and or a local anesthetic placed by the doctor. However, dermal fillers themselves are formulated with lidocaine (a local pain killer), and so the area is actually numbed as it is being injected. The vast majority of patients report little to no discomfort. If you have a fear of needles, called Trypanophobia, read about how we can help put you at ease in our new blog! Reactions are very uncommon, but about 1 in 2000 persons have experienced transient swelling, redness and tenderness at or near the treatment site(s) up to several weeks after treatment. For further details concerning your specific treatment, please consult the doctor. Immediately after the treatment the treated area can be slightly swollen and red. Some patients may also experience bruising around the injection site.This is a normal result of the injection, and it generally goes away in 72 hours. We provide all patients with ice and topical Arnica (if appropriate) which helps alleviate bruising and swelling. We also recommend patient avoid (if medically appropriate) blood thinner like Ibuprofen or Aspirin, as these can increase the risk of bruising. Fillers generally last from 6 months to 2 years, depending on the location they are injected, and your own unique body chemistry. We most commonly use a few different dermal fillers: Radiesse, Restylane, Sculptra and Beloterro — each with their own distinct purposes and unique characteristics. Fillers are sold by the syringe – and pricing ranges from $565 to $795, depending on which product you select. Because they last so long, dermal fillers are a great value. As an added bonus, the injection of fillers stimulates collagen growth under the skin, which in turn gives you added natural volume and new cell regeneration. Dr. Janowski is one of the most experienced injectors in the state, and has seen thousands of patients since 2004. He is currently ranked #1 in Colorado (and top 20 in the United States) for his expertise in injecting dermal fillers, and is an official trainer to other Dr’s on use and technique! He has even developed his own technique, called the “snap technique” in order to minimize pain and bruising, and to ensure longer lasting and more natural results. This is his own specialized way of holding the needle so that he is able to insert into the skin as quickly as possible. Once the needle is under the skin, it generally doesn’t hurt – and he can then carefully place the product in the most ideal location. Additionally, we take special care and time with each and every patient in order to determine which filler is best for you and which areas can best benefit from filler treatment. We would love to meet with you to answer any other questions you might have, or to schedule a free 1 on 1 consultation with one of the best injectors in the state (and country). Feel free to give us a call or send an email!